Finished my reading assignment for myself for this month. Actually I started reading this book some months ago, around September in fact, but only got serious with it late last week, and finished it just now. My head's still spinning. I feel like I can't think properly, but I also feel like I'll forget all my thoughts and feelings about the book now, just like how you forget your dreams minutes after you wake up, unless I write them all down. Kafka on the Shore has two ongoing plots that seem to parallel, yet seem to have nothing to do, with each other. The odd chapters follow Kafka Tamura, who is described by one of the characters in the book as a "cool, tall, fifteen-year-old, lugging around a backpack and a bunch of obsessions." He starts the story by running away from an unhappy home and his father's Oedipal curse in which it is prophesied that he would kills his father and sleep with his mother and sister. At times, Kafka is accompanied by a spectral alter-ego named Crow, who encourages him by spouting the mantra: "You have to be the world's toughest fifteen-year-old" but often he is alone though he never seems to have any trouble getting help from benevolent strangers. He ends up in a remote city and takes up a room in a private library run by an intelligent, transgender, hemophiliac, named Oshima, and the beautiful but aloof Miss Saeki. Kafka initially toys with the idea that Miss Saeki might be his mother who had left their home, along with his elder adopted sister, when he was four. Although he never ostensibly searches for these missing parts of his family, Kafka does look for the mother and daughter tandem in most every woman he meets who fit the age. At one point, he encounters a girl, Sakura, who works as a hairdresser and who admits that she has a brother about his age but that she knows her family and that he couldn't be her brother. Even so, that doesn't stop Kafka from thinking of her as his sister and in so doing, allow the hands of fate to weave their inevitable course. Metaphorically or not, I'm not sure, but it happened in a dream. Or did it? Kafka also develops an attraction to fifty-something Miss Saeki, or at least, to her fifteen-year-old ghost/alter-ego, after listening to the titular song, Kafka on the Shore, whose vague lyrics hold unusual parallelisms in Kafka's life. Is he the boy in the picture? Is the boy his father? At one point in the story, the characters talk about how Kafka is taking over his father's will (by killing him) so that he would desire his mother (and replace him in her life). This is classic Freud. But I was left wondering whether everything happened literally, or is it all just a metaphor? Miss Saeki says, "We're not metaphors," to which Kafka counters, "...But metaphors help eliminate what separates you and me." So even if it's not real in the sense that you and I understand what is "real," it doesn't make it any less real. The other plot in Kafka on the Shore deals with Nakata, an illiterate sexagenarian who is a little slow on the uptake but has unusual abilities, least amazing of which is he can talk to cats. Nakata spends his life searching for what is lost. Literally, the house cats of his neighbors, but metaphorically, his other half. Nakata is described as a man who only has half of a shadow and no memories, "a library without books." Just like Kafka, and most of the characters in the book, he has lost something and is trying, in his own way, for the most part without realizing it, to get it back. After he is manipulated into killing a man dressed up as Johnny Walker, the neighborhood cat-killer, Nakata skips town with the help of a straight-talking, aloha shirt-wearing, truck driver, named Hoshino. While searching for the entrance stone, the same one mentioned in the song Kafka on the Shore, Nakata ends up in the very same library that Kafka had been. It seems a long time ago this entrance stone has been opened and things were never what they should have been. Nakata's role in all this is to make everything right again, i.e. to make himself "normal" again. Does this mean finding, and reuniting, with his missing half? Eventually, the story ends with one of the main characters waking up to a "brand-new world." 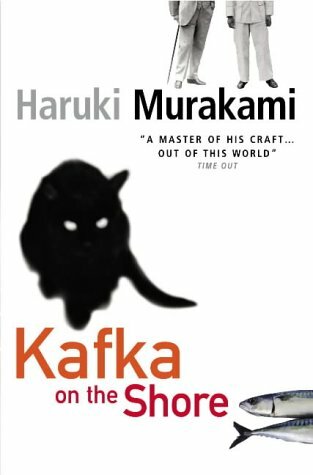 The two main characters Kafka and Nakata never meet but their lives intertwine each other through a series of coincidences. Evidence seems to suggest that they may be the same person. Nakata says that when he sleeps, he dreams of being in a library, reading books. Understand that Nakata, at least in his side of the world, is illiterate, but that Kafka spends most of his time in the library, reading books. And whenever Kafka sleeps, he doesn't dream, or doesn't remember them, which, Nakata doesn't have memories and has no real concept of time or the past. This connection would make sense if we were to presume that Kafka becomes Nakata when he sleeps, and Nakata becomes Kafka when he sleeps. (Which reminds me, Kafka says that the middle-aged Miss Saeki becomes her fifteen-year-old self when the other sleeps.) If this is the case, then that would mean that one of the two worlds the characters live in isn't "real." But reality, at least in Kafka on the Shore, isn't a solid object that you can step into and step out of like walking into a literal doorway. Instead, the journey between the two is seamless, the line is blurred, the conscious becomes the subconscious, reality a dream. "It's like everything around in me's in flux -- like it all has a double meaning," Kafka tells Miss Saeki. In the two worlds that Murakami has created, reality is just a concept -- like Colonel Sanders and Johnny Walker -- something you can bend and shape according to your will, a metaphorical sandstorm, a labyrinth of the world outside and your own inner world where you either come of it changed or to stay where you are, unchanged.